In order to receive, you must let go. It feels nice to be safe and certain of our lives. Security is nothing to scoff at - we need to take care of our physical selves, provide for our basic needs, and doing so isn't always easy. Having enough is a huge privilege, but if we cling to it too long it can become stifling and limited. This week we're at a point that's difficult to reconcile. We may feel that asking for more after having worked so hard to get the basics seems greedy, as if we're tempting fate. Why go and invite in the unknown with any changes if we're fed, clothed, and safe? We can see this position reflected in the Four of Pentacles, and I love how this card shows the sense of stability and pride that comes from providing for ourselves. Sometimes this card appears as a wonderful affirmation - we've made it and it's time to celebrate and get to know all the facets of what we've built for ourselves. But, like any tarot card, it's meant to be a stepping stone on a larger journey. After all, our lives are animated by change, and clinging too hard to what we know can often leave us stuck and out of sync with the larger rhythm of our life. This week we're presented with a choice and it may feel big and intimidating. The Ace of Pentacles is appearing center stage, tempting us with an alluring offer. It's asking us to accept a shiny new gift, but in order to do so we must put down one of our pentacles. Staying with what we know effectively blocks us from this new energy. Remaining in the four may seem safe, but it's no way to grow. Luckily, the Ace of Pentacles is a gentle card. New things can often become the perfect receptacles for our anxiety. Because they're all potential and possibility we can offload all our general anxieties onto them, burying something shiny and new with frightening futures. The Four of Pentacles, while a place to celebrate once you've reached it, can become mired with conservative thinking. Instead of seeing opportunity in newness it sees paths to loss. This is a wonderful time to dig deeper into our ideas of how much we can have and all the roadblocks that we put up in the face of emerging excitement. Where do these thoughts come from? And why might we look to them in the face of something truly exciting? Oftentimes these protective mechanisms have a lot to do with our ideas of maturity and responsibility. The fourth card in the Major Arcana is The Emperor, an archetype that, to be frank, is amazingly adept at triggering old wounds around our experiences with our parents. Is there something about this new pursuit that's bringing up our ideas of how we "should" behave? Are we silently following old ideas of what responsibility looks like, only to trap ourselves in inauthentic thought patterns? The King of Cups emerges on the other side to show us that there's another path. Stability doesn't have to be rooted in utter certainty and known quantities. We can be much more fluid, creative, and flexible in our approach to life while maintaining our sense of responsibility. If anything, this card shows us how we can gather power from embracing the unknown. This is a model of leadership that accepts and trusts in change. If it's inevitable (as we all know) then we can jump on in, a fish swimming in the waters, and navigate with confidence. Sometimes things will be challenging and sometimes they'll be calm. But we can always trust our experiences and the wisdom we've accumulated along the way to guide us. 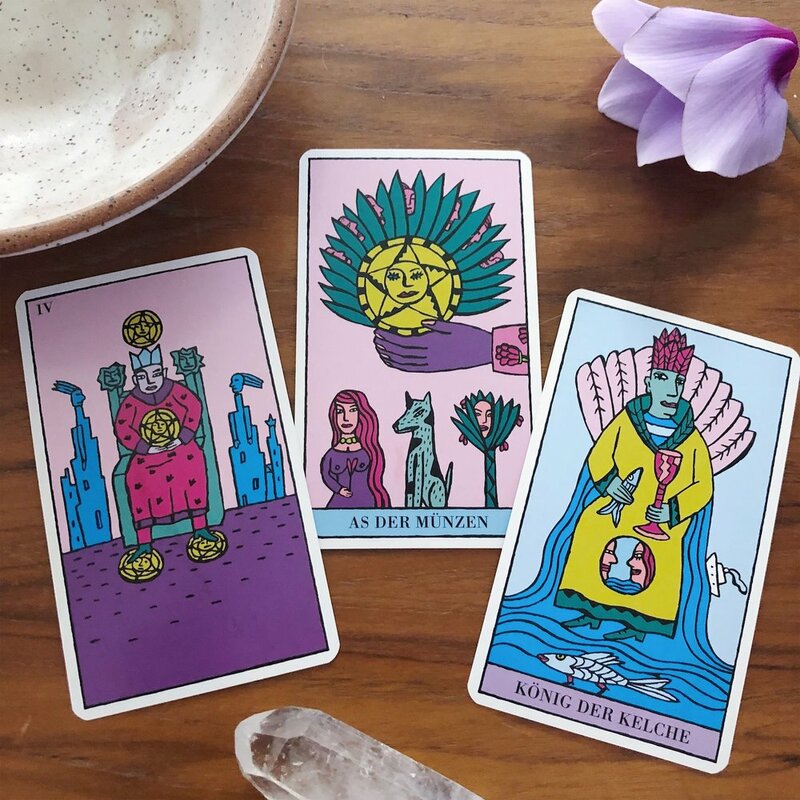 In this mindset, the Ace of Pentacles is a small and beautiful invitation to move further along our path, not some scary entity here to disrupt and challenge everything we've worked so hard for. If there's something exciting on the horizon - an idea, hobby, opportunity, or practice - that you'd like to pursue - this card says go for for it. Start simple and let it be what it is - something new and exciting that's still small. Exploring new things doesn't mean abandoning your security, it simply means building upon it. And that's what security is for, after all. Providing a foundation for our growth and expansion. It can add to our sense of stability and bring in the energy of newness and opportunity. If it doesn't work out, we can always change course. But to turn it away for fear of losing what we already have would keep us feeling stuck.